I have only cooked with wild rice a handful of times, but each time I have I’ve felt that it would make a fantastic substitution for white or brown rice in risotto. I love working with chickpea miso, as it adds a depth and umami flavor to all kinds of soups and raw and cooked dishes, and I thought that it would help improve the texture of the risotto. With these two ingredients as the base, I whipped up a batch of some super queer risotto on this gorgeous Saturday afternoon. Bake 2 sweet potatoes. While these are baking, cook a pot of wild rice. Chop an onion and garlic and sauttee in coconut oil until pleasantly browned. Once sweet potatoes are done, chop them up into little pieces and add to the rice, which should by now be almost fully cooked. Stir in onion and garlic the rice. Add in miso. Let cook for another 5 minutes or so then enjoy. Yay! oooohhh my goooooooosh this looks amazing. on December 10, 2011 at 9:06 pm | Reply Sarah E.
Thanks, Courtney. I have to make it again for us some day when we’re not consuming just liquid greens. Lovely! 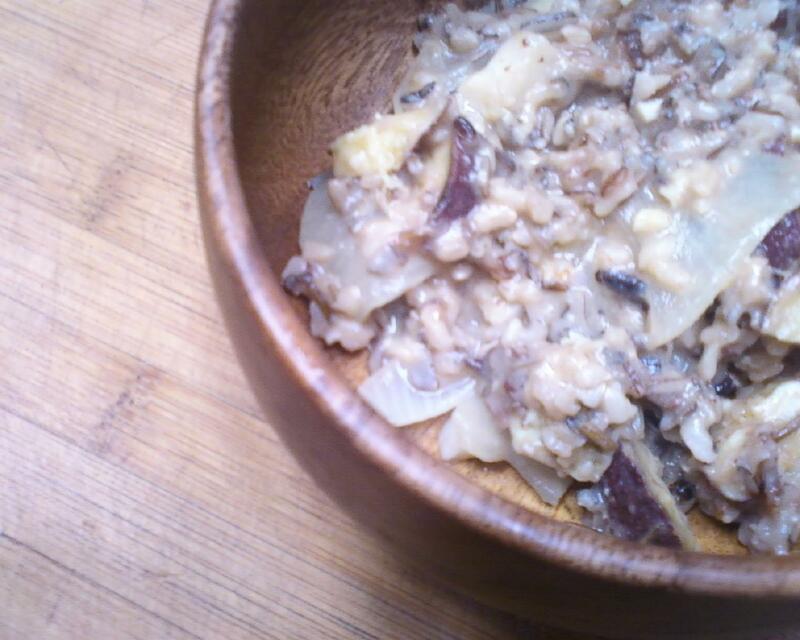 I’ve been wanting to try risotto and I’ve recently fallen in love with wild rice. Can’t wait to cook this up!